Controls - Catering There are 26 products. 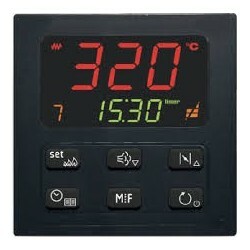 EV9313J9 is a thermotimer and controller for the management of different types of electric ovens. They are available in compact version, in the size 96 x 96 mm (3.779 x 3.779 in); the user interface consists of a double custom display (with function icons), six keys and is IP54 protection rated, for easy cleaning. 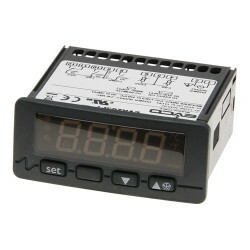 EV9316J9 is a thermotimer and controller for the management of different types of electric ovens. They are available in compact version, in the size 96 x 96 mm (3.779 x 3.779 in); the user interface consists of a double custom display (with function icons), six keys and is IP54 protection rated, for easy cleaning. Single Bin Fryer Controller with 8 menu options, supplied with a probe. 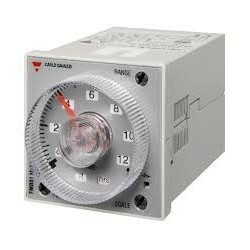 Delay on operate timer with 4 functions and selectable time ranges from 0.05 seconds to 300 hours. Housing 48 x 48 mm for front panel mounting and on 8-pin socket. 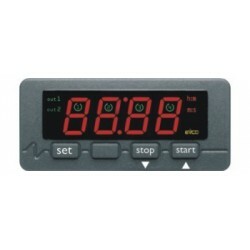 Delay on operate timer with 4 functions and selectable time ranges from 0.05 seconds to 300 hours. Housing 48 x 48 mm for front panel mounting and on 11-pin socket. Panel Mounted Countdown Timer for Control of duration of industrial processes, control of dough retarders, control of cooking time in ovens. 2 Relay Outputs, 12/24VAC/DC Supply, Start Stop Button, or Remote Activation and Buzzer. Panel Mounted Countdown Timer for Control of duration of industrial processes, control of dough retarders, control of cooking time in ovens. 2 Relay Outputs, 230VAC Supply, Start Stop Button, or Remote Activation and Buzzer. 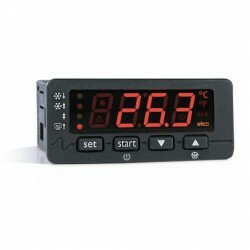 EK356 is for the control of electric ovens and is easy to operate. Time and temperature is easily changed. They are available in compact version, in the size 72 x 144 mm the user interface consists of a double custom display (with function icons) and is IP54 protection rated, for easy cleaning. 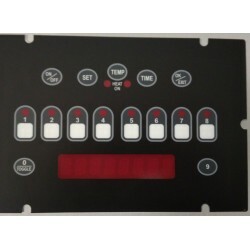 EVK802 is a basic controller for the management of blast chillers.It is available in compact version, in the standard size 74 x 32 mm; the user interface consists of a custom display (with decimal point and function icons), three keys and guarantees an IP65 protection rating, for easy cleaning. The EVCO EVK614N9 is a 230VAC Panel Mounted Prover Controller. The controller has 2 Temperature Inputs, 2 x Digital Inputs and 4 x Relay Outputs for Compressor, Humidifier, Fan and Heater. 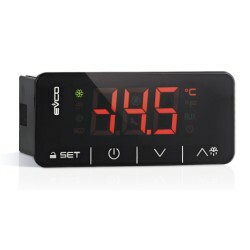 The EVCO EV3B31N7 is a 230V digital temperature controller with a LED display and is capable of controlling medium temperature refrigeration applications as well as heating applications. Ideal for Baine Maries and Incubators Supplied with 1 x 1.5m NTC temperature probe. The EVCO EVK7401J7 is a 230V digital temperature controller with a LED display and is capable of controlling high temperature applications. The controller accepts J or K Type thermocouple probes and has one relay output. The probe is not supplied with the controller. 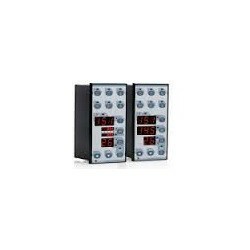 The EVCO EVK9411J6 is a 24VAC to 230V Digital Temperature Controller with a LED display and is capable of controlling high temperature applications. The controller accepts J or K Type thermocouple probes and has 1 relay output. The probe is not supplied with the controller. The EVK431 is a digital thermostat designed to control heating applications like pie warmers as well as cooling applications. 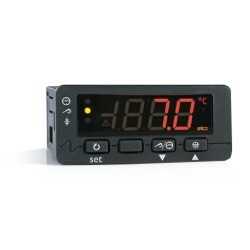 The instrument is provided with two cabinet temperature sensors and a 16A relay output. 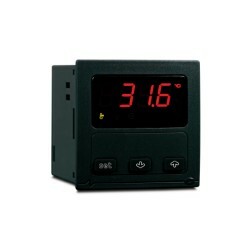 The EVCO EVK411J3 is a 12/24VAC/DC digital temperature controller with a LED display and is capable of controlling high temperature applications. The controller accepts J or K Type thermocouple probes and has one relay output. The probe is not supplied with the controller.